Saturday saw Craig and I doing our last long ride before the Epic. 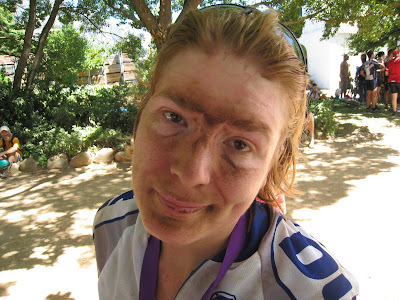 We needed one last tough weekend, and the next day's Argus MTB ride would give us a good indicator of how the training had gone. To add to matters - we were going to be riding with some of the other teams from Hermanus, and it was safe to say that each rider would be sussing the next one out. The result of the ride is that we have sowed fear and panic amongst the competition. We rode every single one of them off of our wheels, and at the same time still felt comfortable. 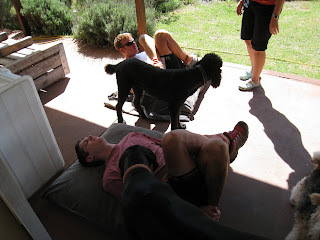 Bonte decided to impart some of her stretching knowledge on us - the dogs we not too amused that we were using their cushions. 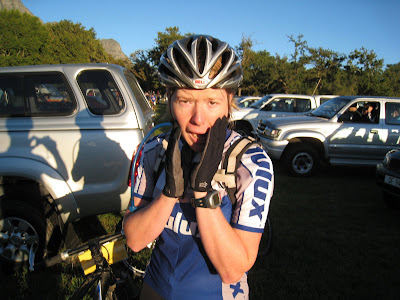 If anything, I had been more nervous about the long ride on Saturday, than I had been for the race. Yolanda, on the other hand, was very nervous. 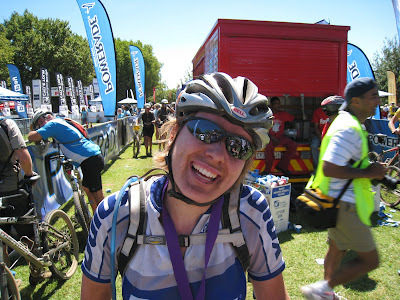 All her other cycling buddies had instead decided to do the 35k, leaving her to do the 55km on her own. The weather had been perfect - for going to the beach. It was hot and windless, and the conditions proved quite testing. Yolanda finishing the race - in much better spirits that last year. Very proud of her medal. She even wanted to go to bed with it. I had to draw the line at that! 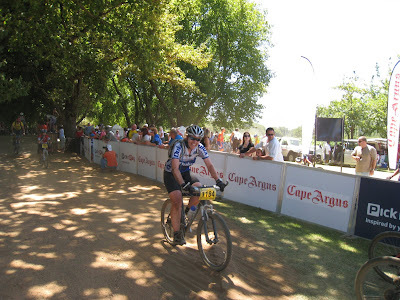 Craig and I both rode well, and had good legs, and once again beat all the Hermanus guys. We both rode new personal best times, and finished together, which bodes well for the Epic.